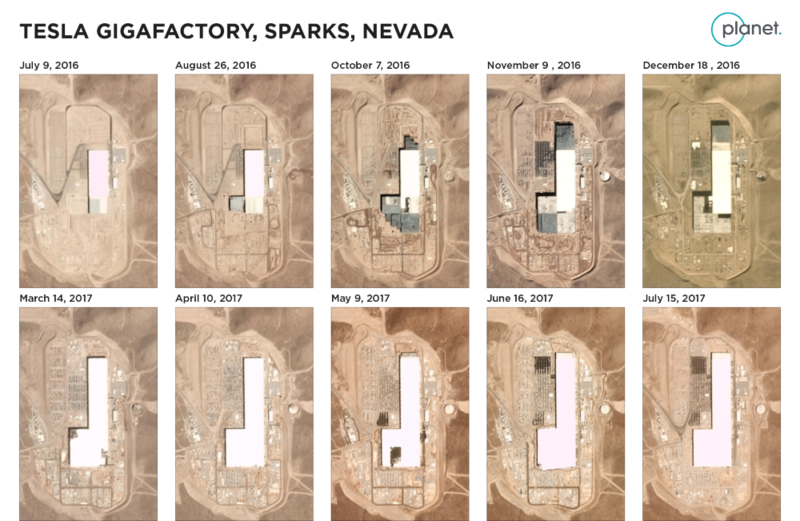 Tesla’s Gigafactory 1 in Nevada has expanded significantly over the last year in preparation for the start of Model 3 production and the ramp up of Tesla’s energy storage business. We now get a good look at just how much it expanded through satellite images of the battery factory. Tesla has been producing Powerwall and Powerpack at the Gigafactory since October 2015, but it has been low volume production. In 2016, the plant really started growing as Tesla started producing its second generation Powerwall and Powerpack, and its battery manufacturing partners, like Panasonic, started establishing some production capacity at the plant. A few months later, Tesla started also building new ‘drive unit production lines’ at the location in order for the Gigafactory to produce the entire powertrain and battery pack of the Model 3 – increasing the production responsibilities of the new factory for the Model 3 program. In January 2017, Tesla announced that Panasonic started producing new 2170 battery cells at the factory, which they used in the new Powerwall and Powerpack and in June, CTO JB Straubel confirmed that new 2170 cells are now being used in Model 3 battery packs. And that’s not even the finished building. The current structure has a 1.9 million square-foot footprint. Including several levels, the factory currently is about 4.9 million square feet of operational space. This represents only ~30 percent of the total finished Gigafactory. Once completed (expected around 2020), Tesla plans for Gigafactory 1 to be the largest building on earth by footprint. There’s a new section coming up on the north side which was visible in a recent aerial view of the factory. There doesn’t seem to be any work on other new sections as Tesla is working on ramping up production in the first sections in order to reach a capacity of 35 GWh by the end of 2018. According to CEO Elon Musk, the total capacity could reach 150 GWh of battery pack output once completed, which is more than the current world capacity.